Dhaka formerly spelled Dacca, named Jahangirnagar during Mughal era is the capital of Bangladesh and the principal city of Dhaka Division. Dhaka is a megacity and one of the major cities of South Asia. Located on the banks of the Buriganga River, Dhaka, along with its metropolitan area, had a population of over 16 million in 2011, making it the largest city in Bangladesh. It is the 9th largest city in the world and also 28th among the most densely populated cities in the world. Dhaka is known as the City of Mosques and with 400,000 cycle rickshaws running on its streets every day, the city is also described as the Rickshaw Capital of the World. Under Mughal rule in the 17th century, the city was known as Jahangir Nagar. It was a provincial capital and a centre of the worldwide muslin trade. The modern city, however, was developed chiefly under British rule in the 19th century, and became the second-largest city in Bengal after Calcutta (presently Kolkata). After the Partition of Bengal in 1905, Dhaka became the capital of the new province of Eastern Bengal and Assam but lost its status as a provincial capital again after the partition was annulled in 1911. After the partition of India in 1947, Dhaka became the administrative capital of East Pakistan, and later, in 1971, the capital of an independent Bangladesh. During the intervening period, the city witnessed widespread turmoil; this included many impositions of martial law, the declaration of Bangladesh’s independence, military suppression, devastation during war, and natural calamities. Modern Dhaka is the centre of political, cultural and economic life in Bangladesh. Although its urban infrastructure is the most developed in the country, Dhaka suffers from urban problems such as pollution and overpopulation. In recent decades, Dhaka has seen modernisation of transport, communications and public works. The city is attracting large foreign investments and greater volumes of commerce and trade. It is also experiencing an increasing influx of people from across the nation, this has reportedly made Dhaka the fastest growing city in the world. Lalbabh Fort constructed in the mid 17th century by Prince Mohammed Azam Shah, son of the Emperor Aurangzeb, and the Fort contains the tomb of Bibi Pari, daughter of Shaista Khan. The existence of a settlement in the area that is now Dhaka dates from the 7th century. The city area was ruled by the Buddhist kingdom of Kamarupa and the Pala Empire before passing to the control of the Hindu Sena dynasty in the 9th century. The name of the city may have derived after the establishment of the Goddess Dhakeshwari’s temple by Ballal Sena in the 12th century. The town itself consisted of a few market centres like Lakshmi Bazar, Shankhari Bazar, Tanti Bazar, Patuatuli, Kumartuli, Bania Nagar and Goal Nagar. After the Sena Empire, Dhaka was successively ruled by the Sultanate of Bengal as well as interruption of governors from the Delhi Sultanate before being taken over by the Mughals in 1608. The development of townships and housing has resulted into a significant growth in population came as the city was proclaimed the capital (Rajmahal) of Bengal under Mughal rule in 1608. Mughal subahdar Islam Khan was the first administrator of the city. Khan named the town “Jahangir Nagar” (জাহাঙ্গীর নগর; City of Jahangir) in honour of the Mughal emperor Jahangir, although this name was dropped soon after Jahangir’s death. The main expansion of the city took place under Mughal general Shaista Khan. The city then measured 19 by 13 kilometres (12 by 8 mi), with a population of nearly one million people.British East India Company in 1765 gained right to collect revenue (Diwani right) and later took over governing in 1793 when Nawabs of Bengal were forced to abdicate all their authority over Bengal, Bihar & Orissa & the city passed on to total British control. The city’s population shrank dramatically during this period as the prominence of Calcutta rose, but substantive development and modernisation eventually followed. A modern civic water supply system was introduced in 1874 and electricity supply launched in 1878.The Dhaka Cantonment was established near the city, serving as a base for British and Bengali soldiers. Ahsan Manzil,was once the palace of the Dhaka Nawab Family; it is now a museum. Bastion of the Lal Bagh, Dacca – 1816. During the abortive Partition of Bengal in 1905, Dhaka was declared to be the capital of the newly established state of East Bengal and Assam, but Bengal was reunited in 1911. Following the Partition of India in 1947, Dhaka became the capital of East Pakistan. The city witnessed major communal violence following the partition of India. A large proportion of the city’s Hindu population departed for India, while the city received a large influx of Muslims. As the centre of regional politics, however, Dhaka saw an increasing number of political strikes and incidents of violence. The adoption of Urdu as the sole official language of Pakistan led to protest marches involving large crowds. Known as the Bengali Language Movement, the protests resulted in Pakistani police firing which killed a number of peaceful student demonstrators. Throughout the 1950s and 1960s, Dhaka remained a hotbed of political activity, and the demands for autonomy for the Bengali population gradually gained momentum. Jatiyo Sangshad Bhaban houses the national parliament. The 1970 Bhola cyclone devastated much of the region, killing an estimated 500,000 people. More than half the city was flooded and millions of people were marooned. With public anger growing against ethnic discrimination and poor cyclone relief efforts from the central government, Bengali politician Bangabandhu Sheikh Mujibur Rahman held a nationalist gathering on March 7, 1971 at Ramna Racecourse. An estimated one million people attended the gathering, leading to the March 26 declaration of Bangladesh’s independence. In response, the Pakistan Army launched Operation Searchlight, which led to the arrests, torture and killing of thousands of people. After nine months of bloody battle with Indian Army and Mitra Bahini, the Pakistani Army surrendered to the Indian Army on December 16 marking the end of the independence war of Bangladesh. As the nation’s capital, Dhaka saw a rapid and huge growth of the city population in the post-independence period, as migrant workers from rural areas across Bangladesh moved to the city. The growth of commerce and industry along with the city’s population has created further challenges to services and infrastructure. A real estate boom has followed the expansion of city limits and the development of new settlements such as Uttara, Mohammadpur, Bashundhara, Mirpur and Motijheel. Dhaka is located in central Bangladesh at 23°42′0″N 90°22′30″E, on the eastern banks of the Buriganga River. The city lies on the lower reaches of the Ganges Delta and covers a total area of 360 square kilometres (140 sq mi). It consists of eight principal thanas –Lalbagh, Kotwali, Sutrapur, Ramna, Motijheel, Paltan, Dhanmondi, Mohammadpur, Tejgaon – and 16 auxiliary thanas – Gulshan, Mirpur, Pallabi, Shah Ali, Turaag, Sabujbagh, Dhaka Cantonment, Demra, Hazaribagh, Shyampur, Badda, Kafrul, Kamrangir char, Khilgaon and Uttara. In total the city has 130 wards and 725 mohallas. Dhaka district has an area of 1463.60 square kilometres (565 sq mi); and is bounded by the districts of Gazipur, Tangail, Munshiganj, Rajbari, Narayanganj, Manikganj. Tropical vegetation and moist soils characterize the land, which is flat and close to sea level. This leaves Dhaka susceptible to flooding during the monsoon seasons owing to heavy rainfall and cyclones. Dhaka experiences a hot, wet and humid tropical climate. Under the Köppen climate classification, Dhaka has a tropical savanna climate. The city has a distinct monsoonal season, with an annual average temperature of 27 °C (81 °F) and monthly means varying between 19.5 °C (67 °F) in January and 32 °C (90 °F) in May. Approximately 87% of the annual average rainfall of 2,123 millimeters (83.5 in) occurs between May and October. Increasing air and water pollution emanating from traffic congestion and industrial waste are serious problems affecting public health and the quality of life in the city. Water bodies and wetlands around Dhaka are facing destruction as these are being filled up to construct multi-storied buildings and other real estate developments. Coupled with pollution, such erosion of natural habitats threatens to destroy much of the regional biodiversity. The Dhaka municipality was founded on August 1, 1864, and upgraded to “corporation” status in 1978. The Dhaka City Corporation is a self-governing corporation which runs the affairs of the city.Recently Dhaka City Corporation has been divided in two administrative part thease are 1)Dhaka City Corporation-North and 2)Dhaka City Corporation-South for ensuring better civic facilities. The incorporated area is divided into several wards, which have elected commissioners. presently These Two corporations are headed by two administrators. The Dhaka Education Board is responsible for administering all public schools and most private schools with the exception of English-medium schools and madrassahs. All madrassahs in Bangladesh are governed by a central board while English-medium schools are under separate educational and governance structures. The city is divided into 25 (i.e. 2011) parliamentary constituencies. The two main political parties are the Awami League and the Bangladesh Nationalist Party. Ramna contains the Secretariat, which houses most of the government ministries. The Supreme Court of Bangladesh and the Dhaka High Court are located in the city. The Bangabhaban palace has served as the official residence of the Viceroy of India, the governor of East Pakistan and presently the President of Bangladesh. The Jatiyo Sangshad Bhaban, designed by renowned architect Louis Kahn, houses the unicameral national parliament. The Baitul Mukarram, developed with a design resembling the Kaaba of Mecca, is the national mosque. Other historical monuments in the city include the Bara Katra palace, the Lalbagh Fort, the Hoseni Dalan and the Ahsan Manzil. To fight rising traffic congestion and population, the national government has recently implemented a policy for rapid urbanization of surrounding areas and beyond by the introduction of a ten year holiday on income tax for new construction of facilities and buildings outside Dhaka. Aside from Chittagong, Dhaka has a water-borne sewage system, but this serves only 25% of the population while another 30% are served with septic tanks. Only two-thirds of households in Dhaka are served by the city water supply system. More than 9.7 million tons of solid wastes are produced in Dhaka city each year. While private and government efforts have succeeded in collecting refuse city-wide and using it as manure, most solid wastes are often dumped untreated in nearby low-lying areas and water bodies. The population of Dhaka (areas under the jurisdiction of the Dhaka city corporation) stands at approximately 7.0 million. The city, in combination with localities forming the wider metropolitan area, is home to an estimated 16.6 million as of 2011. The population is growing by an estimated 4.2% per year, one of the highest rates amongst Asian cities. The continuing growth reflects ongoing migration from rural areas to the Dhaka urban region, which accounted for 60% of the city’s growth in the 1960s and 1970s. More recently, the city’s population has also grown with the expansion of city boundaries, a process that added more than a million people to the city in the 1980s. According to Far Eastern Economic Review, Dhaka will become a home of 25 million people by the year 2025. The literacy rate in Dhaka is also increasing fairly quickly. It was estimated at 62.3% in 2001. By 2010, the literacy rate had gone up to 72.7%, significantly higher than the national average of 56.5%. The city population is composed of people from virtually every region of Bangladesh. The long-standing inhabitants of the old city are known as Dhakaia and have a distinctive dialect and culture. Between 15,000 to 20,000 of the Rohingya, Santal, Khasi, Garo, Chakma and Mandi tribal peoples reside in the city. Dhaka also has a large population of Chinese, Korean, Indian, Burmese and Nepali expatriates working in executive jobs in different industries. Most residents of Dhaka speak Bengali, the national language. Many distinctive Bengali dialects and regional languages such as Chittagonian and Sylheti are also spoken by segments of the population. English is spoken by a large segment of the population, especially for business purposes. There is a minority Urdu-speaking population, who are descendants of displaced Muslims from eastern India during 1947 and sought refuge in East Pakistan. The correct population is ambiguous; although official figures estimate at least 40,000 residents, it is estimated that there are at least 300,000 Urdu-speakers in all of Bangladesh, mostly residing in refugee camps in Dhaka. Islam is the dominant religion of Dhaka’s people, of about 90% of the city practicing the faith; with a majority belonging to the Sunni sect. There is also a small Shia sect, and an Ahmadiya community. Hinduism is the second-largest religion, with about 9%, and smaller communities practice Buddhism and Christianity, both of about .5% each. It is the National Authoritative Board on building planning, estates and resources, plot allotment and construction approvals from both public and private entities. It utilizes the Dhaka Improvement Trust (Allotment of Land) Rule of 1969 and The Town Improvement Act of 1953, both scribed since before the Independence of Bangladesh. Developing countries are now experiencing a serious road safety crisis. Like many other developing countries Bangladesh is experiencing a very severe road safety problem. The road safety situation of the country has been deteriorating with increasing number of road accident deaths, largely as direct consequences of rapid population growth and motorization, unplanned urbanization and lack of legitimate investment in road safety. It is predicted to be worsening the road safety situation in the coming years unless this critical problem of epidemic nature is seriously addressed with significant improvements in the relevant sectors. This paper mainly addresses the accident trends and the issues of road safety in Dhaka City, Bangladesh. It also discusses some contemporary issues needed to be addressed for ensuring road safety. Traffic accident data in Bangladesh is very fragmented and oftentimes very inaccurate because of poor reporting and under-reporting. However, injury and fatality rates per 100,000 population have been increasing constantly and the fatality rate per 100,000 vehicles has increased significantly in the past 10 years in Dhaka Metropolitan Area. Prevention of accidents or reduction of the damages are the two ways to ensure road safety, where the most effective way to reduce accident consequences is to prevent the occurrence of accidents. Proper neighborhood design or urban planning also can improve the road traffic safety. Whatever, this should be remembered that traffic safety is a cooperative effort and requires the involvement of all stakeholders and agencies. vehicles, the CNG-run three-wheeler or possible injury to the people inside it. 1 1999-2007 Collision Fatal Accident Rate Kruskal-Wallis Fatal AR <0.01 ‘Hit pedestrian’, ‘head on’, ‘rear end’, ‘overturned vehicle’ and ‘side swipe’ account for a significantly greater proportion. <0.01 There are significant variations in collision type and locality and also the interaction between collision and locality for fatal accident rates. See the differences in figure # 4.5a. <0.01 There must be significant variations in collision and road class and also the interaction between collision and roads for fatal accident rates. See the differences in figure # 4.5b. <0.01 There must be significant variations in collision and division/ city and also the interaction between them for fatal accident rates. See the differences in figure # 4.5c. <0.01 There must be significant variations in collision and district/ city and also the interaction between collision and district/ city for fatal accident rates. <0.01 With significant variations, non-cities by collision types have lower accident rates than cities except ‘overturned vehicle’. See the differences in figure # 4.5d. <0.01 With significant differences among the collision type and national highway link, ‘hit pedestrian’ is dangerous at any links. At the inquest of the world’s first road traffic fatality on August 17, 1896, the coroner was reported to have said: “this must never happen again”. At more than 60 deaths per 10,000 registered motor vehicles, Bangladesh has one of the worst crash rates in the world. We are right up there with war-ravaged countries like Sierra Leone and Liberia. Compare this to India’s 25.3, Malaysia’s 5.5 and America’s 2.1 and it becomes clear that something is rotten on the roads of Bangladesh. Although the official figure for road deaths is three to four thousand a year, independent studies by international agencies such as the UK’s Department for International Development (DFID) have suggested the actual death toll in Bangladesh could be three times as high. The number of people seriously injured in road crashes is estimated at more than 1,00,000 each year. In cold, hard economic terms, road crashes could be costing Bangladesh two percent of its GDP, says the World Bank — roughly equivalent to the total foreign aid received by the country in a given fiscal year. The horrific death of two of Bangladesh’s most talented media personalities — director Tareque Masud and cinematographer Mishuk Munier — in a road crash outside Dhaka has once again thrust road safety into the spotlight. But draconian laws won’t stop road death. Science will. The traditional approach to road safety puts the onus on the road user — drivers, pedestrians, cyclists. It is held that road users through training, supervision and retribution can cope with the demands of traditional highways without causing accidents. From that view it follows that when accidents do occur, they are the responsibility of the individual road user. Many years ago, when giving evidence in court, a well known traffic engineer in England, John Leeming, noted that when a driver was found guilty of defective driving s/he was fined and sometimes sent to jail — should not a highway engineer if found responsible for a defective junction design receive similar treatment? At the time that was considered highly subversive, but it logically follows from the recognition that the driver is only one element in an interactive system. The approach, advocated by the WHO and road safety agencies around the world, takes into account the interaction of three factors — human, vehicle and environment during three phases of a crash event: pre-crash, crash and post-crash. Buses scrape each other as they race between intersections to get to their “stops” first and pick up more passengers. A human haulier that has no dashboard instruments being driven on streets. Thirty percent of the road accidents from 1998 to 2010, which claimed around 1,200 lives every year, could have been averted if road dividers and speed bumps had been set up to check head-on and rear-end collisions. During the period, 14,876 people were killed and 6,741 others injured in such collisions across the country, according to a report of Bangladesh University of Engineering and Technology (Buet). Buet’s Accident Research Institute (ARI) analysed road accident data of 13 years (1998-2010) and found 45 percent of the accidents were caused by buses and trucks, most of which were illegally modified. Last year, 12,226 vehicles of five modes committed accidents, taking 2,467 lives. Of the vehicles, 1,063 were buses and 801 trucks, according to the ARI. Head-on and rear-end collisions constitute 29.6 percent of the total number of accidents, and they could have been avoided if the authorities concerned had installed adequate dividers and speed bumps on roads and highways, ARI experts say. For example, the premature deaths of noted filmmaker Tareque Masud and media personality Ashfaque Munier Mishuk in Manikganj last year could have been avoided with road dividers and speed bumps in place. In this particular incident, the microbus carrying them collided head-on with a bus on the Dhaka-Aricha highway at Ghior. The bus driver did not slow down even as he turned left, hitting the microbus after travelling about 10 yards from the turn, witnesses told reporters. Speed bumps work as a deterrent on roads and highways to rear-end collisions, as drivers often with fake licences drive recklessly and run into other vehicles, said ARI Director Prof Hasif Mohammad Ahsan. He added that all busy roads, irrespective of their size, should have dividers. 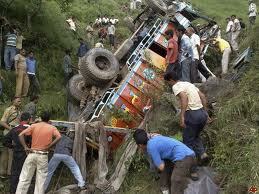 Illegal modification of buses and trucks is also to blame for frequent accidents. “The bodies of almost cent percent buses and trucks are modified through ignoring rules, which is one of the main reasons for road crashes,” Prof Hasif told The Daily Star. Usually, buses and trucks are modified in two ways — by increasing their length and width. “It’s very difficult for a truck driver to notice vehicles coming from behind due to the illegally modified body, which is larger than the driver’s cabin,” he observed. A truck’s width and its driver’s cabin must be of the same size, he insisted. Contacted, Bangladesh Road Transport Authority Director (enforcement) Tapan Kumar Sarker admitted that most of the vehicles plying the roads were illegally restructured. “The BRTA has recently asked all the deputy commissioners to seize all the vehicles that have been illegally modified. And we are also conducting mobile courts in this regard,” he said. The ARI report prepared last month reveals yet another frustrating trend: that although the number of road accidents is rising every year, police reports have it otherwise. ARI sources said they prepared the report based on police record, which showed 3,656 accidents in 2008, 2,802 in 2009 and 2,437 in 2010, indicating a downtrend. Prof Hasif, however, differs with the police record. He says the ARI report does not reflect the reality due to “under-reporting” by the police. The actual number of road accidents will be four to five times the police figure, he said, quoting various foreign organisations. On the fitness of the vehicles, the BRTA director said all the five Vehicle Inspection Centres (two in Dhaka and one each in Rajshahi, Khulna and Chittagong) were inoperative for long, forcing them to inspect the vehicles manually. 1 Vehicle type Involved Vehicle Kruskal-Wallis Vehicle Type <0.01 With significant differences, the buses, heavy trucks, minibuses and motorcycles have higher involvement than any other vehicles. <0.01 With significant differences, multiple vehicles per fatal accidents are more than single vehicle per accident with both having largely involvement of buses, heavy trucks, minibuses and microbuses. See the differences in figure # 4.8a. <0.01 With significant differences, multiple vehicles per fatal accidents are more than single vehicle per accident with both having largely involvement of buses, heavy trucks, minibuses and microbuses. Also, rural localities have significantly higher involvement than urban. <0.01 With significant differences, multiple vehicles per fatal accidents are more than single vehicle per accident with both having largely involvement of buses, heavy trucks, minibuses and microbuses. Also national highways have higher involvement than any road. <0.01 With significant differences, multiple vehicles per fatal accidents are more than single vehicle per accident with both having largely involvement of buses, heavy trucks, minibuses and microbuses. Also ‘hit pedestrian’, ‘overturned vehicle’, ‘head on’, ‘side swipe’ and ‘rear end’ have higher involvement significantly. Import of poor quality buses, use of locally made spare parts and random tampering with vehicle mechanisms contribute to the increasing number of run-down and unfit vehicles on the city streets, transport sector leaders said. The large number of ramshackle vehicles in the capital is also attributed to the manual methods and inadequate technology of Bangladesh Road Transport Authority (BRTA) in carrying out fitness tests and reluctance of police officials to impound unfit buses. Reckless driving by untrained drivers is contributing no less to the rising number of worn-out vehicles as such driving results in frequent accidents causing serious damage to the vehicles; incidents of minor damage are an everyday affair, they said. Consequently, dilapidated buses and minibuses continue to crowd the streets of the capital, posing serious risk of accidents for commuters and pedestrians. Currently there are about 7,367 buses and minibuses operating on 157 routes in and around the capital city. About 50 percent of them have not had any fitness certificate for a long time, according to top BRTA officials. He also said bus owners always tamper vehicles with local technology to draw maximum benefit. The vehicle is operated even after the expiry of its economic life through overhauling and changes of their exterior and interior. In August 2008 and in 2002 the government slapped a ban on 20-year-old buses in the capital city that had never been implemented for non-cooperation from the owners. It was also planned to send old vehicles to other districts across the country. Some owners, however, said the main flaw lies with the procedure of issuing fitness certificate, which is usually done manually. BRTA lacks automated vehicle inspection system. According to section 47 of Bangladesh Motor Vehicle Rules-1984, BRTA inspectors are authorised to check complete mechanism of a vehicle, which includes functions of 83 points. Most important of them are checking smoke emission, power transmission from engine, operation of brake, lighting, wheel alignment, steering, mirrors and the condition of chassis. “Besides, the BRTA has only two magistrates to carry out mobile court operation. During the drives owners take unfit buses off the road and they return to the streets right after the drive is over. “With more magistrates the drives could have been more frequent,” he added. The official, however, said the responsibility of enforcing laws lies with the police department. However, Shafiqur Rahman, joint commissioner for traffic, Dhaka Metropolitan Police, denied the allegation and said that regular drive is going on. “When unfit buses are caught the owners sign an undertaking saying that they will send the vehicles out of Dhaka but after refurbishing the exterior they bring those back on the streets as usual. Police department is not responsible for checking fitness,” he said. He mentioned that trainings are also going on twice a month for drivers at different bus terminals of the city to increase awareness. Taken in isolation, stricter legislation or public awareness initiatives won’t be able to prevent the tragedies that are played out on the roads of Bangladesh every day. A combination of scientifically designed roads, better law enforcement and road user sensitisation — Safe Systems — will succeed in turning the tide. Improve the planning, management and co-ordination of road safety and reduce the traffic accidents and casualties by implementation of adequately resourced national and district multi-sectoral road safety plan under the guidance of the National Road Safety Council with monitoring by BRTA. Get better traffic accident and casualty data system and establish an accurate and comprehensive national accident and casualty database, to ensure that the data are disseminated by used to identify problems and design remedial measures. Develop the road safety engineering and prevent the traffic accidents and casualties through safety conscious planning, design, construction and maintenance of roads and improve hazardous locations using low-cost engineering measures. Look up the road and traffic legislation; and revise and precise the traffic legislation promoting road user compliance with regulations intended to maintain a safe and efficient traffic flow. Apply traffic enforcement and develop a more effective and efficient traffic police capable of instilling safer road user attitudes and behaviour through the use of modern training, increased mobility, equipment and expanded powers. Update the driver training and testing; and Improve road safety by ensuring minimum standards for driver competence through improved driver training and testing procedures. Alter the vehicle safety and improve the road worthiness of vehicles using Bangladesh’s roads by ensuring that minimum safety standards are met. Implement the road safety education and publicity programmes in order to improve the knowledge, attitudes and behaviour of all road users, through a combination of formal education, non-formal education, adult programmes and mass communication. Over the last few years the transportation problem of Dhaka City has visibly been deteriorating steadily. Citizens constantly complain about the unbearable twin problems of traffic jam and air pollution. Democracy watch decided to address this problem through an opinion poll covering around eight hundred households randomly selected from several purposively selected neighbourhoods of the city, representatives of middle and lower income areas. The questions asked focused mainly on three issues: (a) the nature of the problem as perceived by the surveyed residents, (b) their understanding about the causes of these problems and (c) their recommendations on solutions to these perceived problems. Some preliminary results from this survey were presented at a workshop, which was participated by persons associated with the formulation and implementation of traffic policies, rules and programmes .This Draft Final Report benefits from valuable discussion and comments received at the workshop. The methodology of this survey is explained below in brief. It is easy to see that the study extended beyond a standard opinion poll and entered the arena of investigative research in seeking some explanations to perceptions as well as behaviour. (a)City lay-out (master plan) and over-population: The causes of traffic congestion in Dhaka city are multifarious. Starting from the city itself, it is observed that the skeleton, structure and lay-out of Dhaka City are not well-planned and well-directed…. In today’s world, the success of a city depends on its economy, which in turn is dependant on the infrastructure, among other things. The importance of the infrastructure can be particularly felt by the citizens of Dhaka in its traffic system, as its congestion reminds us of how important it is to have a good transport system. • We the citizens of Dhaka are suffering because our traffic system is failing us, as it is resulting in less efficiency in various fields, such as business. • Due to traffic congestion, our valuable times and energy are being wasted. • The problem of traffic congestion and uncontrolled vehicle emission make life miserable in Dhaka city causing threat to health. • Everyday work-hours are unnecessarily wasted due to traffic jam. It has a great economic impact on production and thus on our economy. • Traffic congestions intensify sufferings of commuters keeping people motionless as well as creating suffocating condition in the streets. Is this essay helpful? Join OPPapers to read more and access more than 600,000 just like it! 1. The minimum road requirement is 25% for a standard city, whereas Dhaka has only 7.5% road of its total area which is creating huge traffic. Moreover, if we look at the map of Dhaka city, the road connection of north and south is comparatively better than east and west which is causing people to take a longer route to travel. 2. The district truck and bus travel through heart of the capital city due to no bypass road. For example, a person who lives in Chittagong must enter Dhaka to reach Kushtia. 3. The Export Processing Zone (EPZ) which is established near Dhaka forces the vehicles to move from Savar to Dhaka to Chittagong. Our EPZ is oriented to bulk products like garments and it must be located near sea port. 4. Every day thousand of people are entering the city as our economic activity and administration like education, health sector are all Dhaka centered. There is no attempt for decentralization. Thousands of pedestrians in Dhaka jaywalk every day, particularly during rush hours, risking their lives and the lives of motorists and sometimes with fatal consequences. Jaywalking has reached such an alarming state that fatalities are recorded almost every day. Pedestrians are often seen crossing the streets at places they are not supposed to while talking to each other or on mobile phones oblivious to things around them. Some seem to be unaware of the doctrine “Don’t run across the road”. Jaywalking is so widespread that it has become almost a norm and motorists are often blamed for mishaps despite the fact that the pedestrian he or she hit was jaywalking. The fast Airport Road from Uttara to Mohakhali, Kazi Nazrul Islam Avenue, Shaheed Tajuddin Sarani (Tejgaon), and Mirpur Road are the ones where most fatal accidents to pedestrians happen. Largely, people’s tendency to flout traffic rules and lack of adequate facilities for pedestrians, illegal occupation of pavements by parked cars, shops, vendors and construction materials contribute to pedestrians use of the streets, said traffic experts. A journalist died at Bangla Motor intersection while crossing Kazi Nazrul Islam Avenue in 2005. Dhaka University student Shammee Akhter Happy was run over by a speeding bus while crossing the Shahbagh intersection in 2005. Sultana Akhtar Sumi, a 20-year student of Narayanganj Art College, died on April 3, 2009, as she stepped on a livewire and fell from the under-construction footbridge near Shishu Park. According to Accident Research Institute at Buet, 380 deaths occur on the streets of Dhaka every year, and 75 percent are pedestrians. “Lack of enforcement of law to free pedestrians’ facilities is the foremost reason why people go on jaywalking,” said M Rahmatullah, former director (transport) of United Nations Economic and Social Commission for Asia and the Pacific. Absence of useful underpasses, footbridges and pavements force people into jaywalking, said Rahmatullah. On controlling jaywalking, Selim Md Jahangir, deputy commissioner (traffic west zone) of Dhaka Metropolitan Police, said it is practically impossible for the police to stop jaywalking because it is a massive problem with almost everyone having a tendency to break traffic laws. The volume of pedestrians compared to that of vehicles at certain places is many times higher and police have to control traffic, he said. Dhaka City Corporation, entrusted with providing facilities to pedestrians, has been turning a blind eye to pavements occupied by illegal structures, parked cars, makeshift shops and construction materials. The DCC has only 390 kilometres of pavements while it has 1,900 kilometres of roads, said DCC officials. Most of the 52 footbridges in the city remain unused for various reasons. The DCC has four underpasses: one each at Gulistan intersection, Gabtoli bus terminal, Syedabad (Dhalpur) and Karwan Bazar. Apart from the one at Syedabad, the rest are in a poor state. Prof Jamilur Reza Chowdhury, noted civil engineer and transport expert, said a key reason behind jaywalking is that most of the city dwellers are rural people who migrated or are first-generation urban dwellers. Another reason is utterly unplanned footbridges that the pedestrians do not feel encouraged to use. Footbridges are not in a favourable state for the pedestrians to use. Some of them have been taken over by vendors, beggars and vagabonds, like the one at New Market, or they have human excreta on them. “They are not user-friendly,” he said. Provision for on-the-surface pedestrian crossings should also be there too. People’s tendency is not to climb up a footbridge. Moreover, there are no required footbridges across many busy roads like Shaheed Tajuddin Sarani (Tejgaon), Gulshan Avenue, and at intersections like Shahbagh, Nabisco, and Mohakhali. Existing traffic signals are not pedestrian-friendly at all, according to those who research in the transport sector. Physically disabled, elderly people and children have no alternative but to use the footbridges. According Prof Nazrul Islam, an urban researcher, around half the city dwellers go to work on foot. Around 90 to 95 percent of the poor and people of the low-income group go to work on foot. Roughly, one crore people live in the DCC area of around 150 square kilometres. Prof Jubayer-bin-Alam of Civil Engineering Department of Bangladesh University of Engineering and Technology (Buet) in a study on Sustainable Transport for Urban Poor found 12 of 20 lakh garment workers go to work on foot in the central part of the city. Sheikh Mujibur Rahman, chairman of the parliamentary standing committee on the communications ministry, earlier admitted that many footbridges have been built without any proper planning. (a) City lay-out (master plan) and over-population: The causes of traffic congestion in Dhaka city are multifarious. Starting from the city itself, it is observed that the skeleton, structure and lay-out of Dhaka City are not well-planned and well-directed. Dhaka is also a highly populated city. More than one crore people live here and the figure is increasing day by day. This huge population acts as an auto-catalyst of traffic congestion in Dhaka City. (b) Inadequate and unplanned roads: Dhaka City has very inadequate road networks. For a standard city, where the minimum road requirement is 25%, Dhaka has only 7.5% road of its total area. 30% of this 7.5% road is also occupied by the hawkers, salesman and shopkeepers. A significant portion is occupied by construction materials and waste-containers of the City Corporation. As a result, vehicles do not get sufficient space to move on. Besides this, in most cases roads are serpentine rather than being straight. This ultimately breeds a number of unnecessary junctions where vehicles automatically slow down. Again, these roads are also not well constructed and regularly repaired. City Corporation, DESA, WASA, BTTB excavate the roads randomly without any integrated and central plan. Lack of proper maintenance causes the vehicle to stop without any prior notice. During the rainy season the situation becomes more critical while the roads go under water due to heavy rain. (c) Heterogeneous vehicles and inadequate public transport: Dhaka is a city of heterogeneous vehicles. Human puller to latest model automobile, mechanical to non-mechanical, slow to fast-moving, nothing left on the road of Dhaka. It is quite difficult to control all these vehicles on the same road as they have different speed capacity. Besides this, public transport system in Dhaka city is not adequate and properly-routed. Instead of big and spacious buses, presence of large number of mini-buses and private vehicles can only contribute to carry few passengers, but not to reduction of traffic congestion. (d) Rail crossing: Everyday we are experiencing movement of 74 trains to and from Dhaka. On an average, it takes five minutes to get the clearance for each crossing. Thus in one crossing, everyday the vehicles stop for six hours that is really difficult to offset. (e) Insufficient parking arrangement and road blockage: Limited parking arrangement is another major cause of excessive traffic in Dhaka City. It has become a regular practice to park the car on road. Even during rush hours, people are seen loading and unloading their vehicles on a busy road. City transports also stop here and there without any valid reason. The three major bus stations, Sayedabad, Gabtoli and Mohakhali do not have sufficient capacity to accommodate all the buses operating from here. A recent addition to road blockage is the long queue of vehicles at CNG stations, which is really difficult to overcome. (a) People are not law abiding: At this stage, I am going to mention a few problems that we always face to address the traffic issues. Most important problem that we realize ‘people are not law abiding, they do not want to follow traffic rules’. Pedestrians show less interest to use footpath, foot-over-bridge or under-pass. Similarly, drivers neither try to maintain the speed nor follow the lane. In most cases, as the punishment is nominal, they tend to breach the rules again and again. (b) Inadequate logistics: Our traffic management system is not automated and well-equipped. All the junctions are not facilitated with signal lights. Where there are lights, most often those remain out of order. Moreover, uneven flow of vehicles from different directions reduces the effectivity of traffic signals. Besides, we do not have sufficient vehicles to chase a car or bus committed an accident. (b) Shortage of Manpower: We do not have sufficient and well-trained human resources. Four thousand officers work in two shifts- morning and afternoon. Due to administrative and other involvement, only fifteen hundred officers can be engaged in one shift to control the movement of millions of people and vehicles in Dhaka City. This figure is quite insufficient to manage the existing traffic scenario. Now I am going to highlight a few of our achievements. We have already made most of the important roads free from non-mechanical vehicles especially rickshaw. You can understand very well, complete withdrawal of rickshaw is a very sensitive and delicate issue. Thousands of people are living their lives by pulling rickshaws, and also this is one of the popular communication means for low and mid-level income group people. However, following the existing rules, and time to time government instructions, we have conducted several operations against illegal rickshaws and filed a number of cases. We have introduced one way vehicle movement strategy in different areas. This has given much better result. We are taking strict legal action against violators of traffic rules. Last year we filed 4 lakh 88 thousand cases and realized 16 crore 50 lakh taka as fine. We have arranged several strategic and motivational meetings with government and transport agencies and finally succeeded to control the movement of truck and other long-route vehicles. Now trucks and long-route buses can enter city only after 10 o’clock at night. We have also conducted special operation against model-out vehicles and the number has reduced significantly. Removal of baby taxi is a notable example. However, it is understandable that resolving the problem of traffic jam in Dhaka city is not possible within a short time. It needs both short-term and long-term strategies. Short-term strategies may include re-adjusting the school and office time keeping at least one hour difference, re-routing the public transport, reducing and replacing private transport with convenient and cheaper public transport, fixing different fare for rush and non-rush hour and finally keeping the foot-ways free from hawkers and shopkeepers. Long-term strategies, on the other hand, may be constructing long flyover from one end to another end of city, introducing underground rail service, undertaking co-ordinated and integrated strategies among different agencies working for city development, replacing rickshaws by assuring proper rehabilitation of rickshaw-pullers, constructing under-pass and foot-over-bridge in different important junctions and finally decentralizing the city itself. To reduce traffic congestion in Dhaka City, the most vital prerequisite that I feel, is the development of public consciousness. Unless and until we change our perception and develop a mind to abide traffic rules, whatever strategy we take, that will not work properly. I believe, our law-abiding consciousness, good-intention and sincere co-operation can remarkably reduce traffic jam in Dhaka city. These were all from me. At this stage, I would like to invite questions from you. I believe, your participation will make the session more enjoyable and will definitely enrich my understanding and knowledge. Again, I would like to take the honour to extend my cordial thanks and appreciation to the authority of ‘American Chamber of Commerce in Bangladesh’ for inviting me here in this scholarly gathering. I do believe, today’s ceremony is a shiny reflection of better friendship and relationship between Bangladesh and US government. I hope and expect, in future, this relationship will bring more fruitful and beneficial results for both the countries. From Northern part of Dhaka, main business district Motijheel is about 25 kilometers. If a car moves at the speed of 60 KM per hour, one should reach Motijheel in 25 minutes. If at 30 KM per hour, even than people should reach in 1 hour maximum. But it is a common scenario in Dhaka that to reach from Northern part to the main business district during rush hours one needs more than 2 hours at least. Sometimes it is even 4 hours. During all governments in the recent years, it has been a public demand that government should take steps to ease Dhaka traffic congestion. To ease traffic congestion, during the last BNP government [2001-2006] two FLYOVERS has been constructed in Dhaka. One at Banani and the other at Khilgaon area of the city. Adding of two flyovers doesn’t seem to have done much in easing traffic congestion. Government has to think of other substitutes. Already government has declared building of circular river ways centering Dhaka. During the rule of BNP government a circular river way was made. But because of poor maintenance and improper management, the venture didn’t work. Massive renovation work is required to put the things back in shape. The concerned minister has already taken initiative to restore the river ways around Dhaka. Once it was believed that main reason for Dhaka Traffic Congestion is slow moving Rickshaws. But, now a day almost all the main avenues of Dhaka are free from Rickshaws. Except for a few main avenues and inner lanes, Dhaka is free from Rickshaws. Removing of Rickshaws certainly has been beneficial in doing something, e.g., if Dhaka still had Rickshaws plying on the main roads along with the fast moving vehicles, Dhaka would completely paralyze. Expansion of commuter train service connecting Dhaka and adjacent districts in order to reduce pressure of traffic in the capital is under active consideration of the government. The government has a plan to introduce more commuter trains connecting Dhaka with its adjacent districts to free the capital from traffic congestion. One problem still remains, as some of the Rail-Ways pass through one of the busiest roads in Dhaka, when Trains pass; obstruction has to be created to avoid collision. According to experts that creates congestion not only near the Rail Gates but in the whole city. There is a substitute method in resolving traffic congestion. Many experts believe that there should be no rail roads within the city. These roads which belong to the Rail Ways can be transformed into ONE WAY EXPRESS WAY with FLYOVERS or UNDERPASSES where it meets the existing roads. Uttara Model Town is located in the Northern end of the Metropolitan Dhaka. There is already a Railway station quite adjacent to Uttara. According to many, Trains coming from other districts, should not be allowed to go within the city. Because it hampers the flow of other vehicles. There was a time when Dhaka International Airport was within the city. When the airport was shifted from the main city to the present location, people thought it was needless. But now, need to shift even the present airport to a far-away place is under active consideration. Same way, in case of the Railway Station, the main station is located in the busiest area of the city, Kamalapur. Kamalapur Railway Station was built in the sixties. The railway minister put emphasis on improving the railway system as train fares is cheaper and the service comfortable compared to other modes of transport. But it should be also considered that if more trains run, more of traffic congestion will surely be created as it will interrupt other vehicles to flow smoothly! Men have stepped on the moon. Now they are going from one place to another with few hours. But the citizens of Dhaka(sometimes) can not reach to Gulistan Jatrabari from Mohakhali or Farmgate within few hours. Who is responsible for this? Traffic Jam is that magician. Traffic jam has become a great monster in our modern life. Traffic jam has turned daily trips into nightmares. The business community inevitably suffers for the constant waste of its most precious resource of time. Others commuters complain of being stuck in jam for hours an end, while residents breathe in a lat more lead and almost 10 percent of its population seeks medical treatment each year for air pollution related respiratory illnesses. I. Drivers don’t comply with traffic rules. II. Allegations of police support to makeshift shops on footpaths and street sidelines and illegal automobile and rickshaw parking, which occupy more than a third of the streets. III. Some police officers are busy for extracting money for allowing illegal parking. IV. Lack of automatic traffic signals, slow-moving illegal rickshaws and rail crossings are also causing serious traffic jam. Many roads of Dhaka city are not spacious according to the necessity. As aresult, traffic jam occurs very now and then in the congested areas even of the highways. Overtaking tendency is another reason which causes traffic jam. Moreover, our traffic system is not so modern and the number of traffic police is insufficient. It is a matter of shame that some so-called politicians., student leaders and selfish persons also create traffic jam in order to fulfill their evil desires Rickshaws also reate traffic jam. Traffic jam stops our normal course of life. At office time it is painful to mention that the foreigners hesitate to invest in our country for traffic jam. It is very shameful for us. In this way it defames our prestige to the foreigners. Above all traffic jam always pollutes our environment. Obnoxious smell emits form standing vehicles. I. Stricter laws need to be enforced to maintain discipline. III. Harsh punishment must be imposed on those law enforcing members who does not carry out their duty. IV. The signal post should be constructed as early as possible. V. The awareness campaign should be launched which will feature community level meetings, opinion pools, roadside banners, leaflets and posters, mass media advertisement and public announcement to build awareness about making road free from rickshaws. VI. Rickshaws should be banned from the roads such as Rokeya Sarani-Mirpur 10-Farmgate, Pragati Sarani-Baridhara-Badda-Mouchak,New Eskaton Road-Banglamotor-Mouchak-Rafarbagh Crossing and Techical crossing-Mirpur-1-Mipur 2 and Azimpur to Tikatauli, Purana Purana Paltan to Sodarghat via North-South road also. VII. According to Dhaka City Corporation (DCC), 77,000 rickshaws and 10,000 vans are registered but about three lakh rickshaws ply the streets. So the authorities need to evict illegal rickshaws. The Answer To Jakarta’s Traffic Jam? When you first step foot in the capital city, Dhaka of Bangladesh, the first thing you will notice is the intense traffic jam. Dhaka is facing one of the major problems that is already being faced by other big cities in the world, more vehicle than the amount of the roads. Therefore, as a result, traffic jams are increasing day by day and it is becoming one of the most intolerable factors of the country. Since Bangladesh is a small country, the capital city is considered as one of the biggest one. It has roads as much wide as it was needed and wherever needed. But, in the recent times, there has been a significant increase in the number of vehicles of the city. With the other reasons as well, the whole problem is becoming one of the biggest ones of the country. The increased number of vehicles is an alarming factor for the country. A recent statistics shows that each day, Dhaka city gets 2000 new vehicles. For these purposes, neither did Bangladesh government plan ahead, nor they are taking any significant measures now-a-days. As a result, more and more traffic jam is making the lives of normal people a living hell. Traffic management system of Bangladesh is still the ones that were used to be in the 80s. Therefore, the new methods of traffic management is not being applied properly. Rickshaws, however, are identified as one of the most common reason for traffic jams. The number of rickshaws is very much high and they don’t maintain any law whatsoever. However, you cannot eradicate them off the street either because they are one of the best ways of communication and the greenest vehicle you may find. Parkings in the country is horrible because there isn’t enough space for parking. Most of the buildings of the country thought of having room for their works inside their buildings but never even concentrated on having a parking spot. Therefore, the parking areas chosen by these workers here are the roads itself! Bangalis have a tendency to break the traffic law. All of them are like in a competitive flow, who can go before. Such tendency are forcing them to break the law, hence, increasing unwanted traffic jam. The ways to get out of these situation will cost money, well-thought traffic management system and organization. Money will be needed to improve the infrastructure of the country. It will be needed to build new flyovers, underground railways etc. to help the conditions of the country. A well planned traffic management system can help city by not having unwanted traffic jams. Organization includes the process of having a proper traffic rules and organization of rickshaw. Since rickshaws cannot be eradicated, they must be well-organized so that they don’t keep any hand on traffic jam enhancements. If the government takes and proper initiatives, they can get rid of traffic jams more easily they think they can. It’s just a matter of time that the city will be flourished with an organized traffic-jam free road. Frequencies of road traffic accidents and casualties in Bangladesh have been growing steadily in recent years, particularly in terms of fatal accidents and fatalities. (However, rates have dropped). For better understanding of patterns of frequencies and rates of traffic accidents with casualties, a statistical analysis has been conducted for accidents with casualties. This analysis is also conducted for determination to what extent traffic accidents and casualties are related, or whether these are prejudiced by different attributes/ locations. The findings from this study will aid the road users and policy-makers to better understand the issues associated with traffic accidents and casualties. In this thesis, the relationship between accidents and casualties (by locations, attributes, ages, genders, time and involved vehicles) are examined by exploring, analysing and modelling. The association between locations’ populations/ population densities and their traffic accident rates are also examined as a comparison for urban and rural localities; for national highways, regional highways, city roads, feeder roads and rural roads; for divisions/ cities and for districts/ cities. Again, the association between locations’ populations/ population densities and their casualty rates are also examined as a comparison for ages and genders; for ages and alcohol-drinking; for ages and helmet-wearing. The interactions were also explored, analysed and modelled. To identify the locations/ attributes associated with frequencies and rates of traffic accidents with casualties in Bangladesh, an extensive review of the relevant literature is conducted. This review detected to what extent traffic accidents and casualties are associated with attribute levels and location levels. To validate the findings from literature review, an analysis of traffic accidents and casualties data covering the whole Bangladesh, is examined. The analysis has identified significant characteristics with locations and attributes associated with traffic accident and casualty rates. Traffic casualties, however, only occur when the casualties are involved in a traffic accident. In this thesis, the relationship between various locations/ attributes and traffic accidents with casualties are also analysed. By identifying that traffic accidents and casualties may be influenced by different locations/ attributes, measures can be taken to reduce it effectively by targeting resources accordingly. The current statistical analysis has disclosed that frequencies and rates of traffic accidents with casualties are higher in cities/ urban road environments compared to non-cities (divisions or districts)/ rural road environments. The effects of population density of location in which accidents and casualties lived, is also analysed. The effects of the interactions between locations and attributes on frequencies and rates of traffic accidents with casualties are also examined. For the majority of road user groups, these are similar for those living in urban and rural localities. These tend to be significantly higher for individual living in cities and urban localities tend to have significantly higher these than in rural localities. Traffic accident-casualty rates involvements are examined and analysed based on area characteristics provided at location (division/ city, district/ city, locality and roads) levels. Results of the analysis (applying different regression techniques) indicate that accident involvement is associated with location characteristics. Rates (per 10,000 people) of road traffic accidents with casualties are significantly higher in the cities of Dhaka and Rajshahi. Except these two cities, Narayanganj, Feni, Madaripur, Munshiganj, Faridpur, Sylhet, Gopalganj, Narsingdi, Gazipur, Manikganj and Rajbari are highly affected by rates of KSI accidents with casualties. Rates of KSI/ fatal accidents with casualties are higher in cities than in non-cities. Fatal accident rates are higher in urban than in rural, although rural road environments have higher frequencies of accidents than that in urban. National highways and City roads account higher accidents than any other road class. ‘Fatal hitting pedestrian accidents’ and ‘fatal tee junction accidents’ are main types of collision and junction respectively. Dhaka City, Rajshahi City, Dhaka division, Chittagong city and Sylhet division are highly exaggerated by the rates of fatal hit pedestrian type accidents. Also the four cities as Rajshahi, Dhaka, Chittagong and Khulna are highly exaggerated by the rates of fatal tee junction type accidents. Fatal accidents are lower ‘at junction’ than ‘not at junction’. Morning and late-night have the highest and the lowest accidents respectively. Fatal accidents are higher on Sunday, Friday and Thursday. Fatal accidents are higher on January, March, April, May and December. Pedestrians are by far the highest casualty type represented in killed or seriously injured casualties followed by drivers and passengers in head on incidents. Pedestrians seem to be particularly vulnerable on national highways which connect cities. Frequencies of males’ fatalities are about 2.5 times more than females. Motorcyclists without helmet wearing have higher frequencies of fatalities than with helmet wearing. The main vehicles involved are trucks and buses, which are often over represented in roll over accidents. For one vehicle per accident, only the motorised vehicles as buses, heavy trucks, minibuses, microbuses and tempos are highly involved. On the other side, the both motorised and non-motorised vehicles as heavy trucks, buses, rickshaws, motorcycles and bicycles are highly involved. As the statistical analysis is based on government data, it may differ if any body analyses the data getting from other sources. Additional research is required to determine how generalisable these findings are. Another issue for consideration is the level of change affecting many aspects associated with traffic accident and casualty rates. Vehicle levels are being increased with time. Technological and engineering advances, in terms of vehicle design and road network, are also evident. Travel patterns don’t remain constant. Other studies with limited objectives and narrow scope and those conducted even relatively recently, may not be robust enough to identify attributes/ locations associated with traffic accident and casualty rates in Bangladesh today. In this thesis, a broad range of issues are systematically examined and important findings are prepared to ensure that policy-makers have access to the critical information they require, this area of research needs to be continued.